While moisture stress can be a major factor limiting sugarcane production in many districts, the opposite situation, waterlogging - usually caused by poor drainage - can also have a significant impact on production in most districts. Drainage problems commonly occur where natural drainage is inadequate for prevention of waterlogging, where clearing or natural vegetation or irrigation has raised water tables, or where farming operations have interfered with natural drainage pathways. Improvements of natural drainage to promote better disposal of both surface run off water and sub-surface drainage water is essential to ensure successful sugar production. 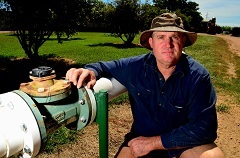 A pilot project in the Burdekin has shown promising signs that conjunctive use de-watering bores could become an effective solution to combat rising groundwater levels in the district. In an area where plant cane can return 150 tonnes to the hectare, it makes sense for farmers to manage the health of the aquifer and in the process ensure their irrigation future. Watch more. 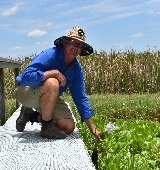 the lagoon on his farm. Burdekin farmers Gary and Angela Spotswood took out the Reef Conservation Award at the 2017 Reef Alliance Awards in Townsville thanks to their work in restoring the ecological function of a coastal wetland ecosystem located on their property. The pair have returned the lagoon to its natural seasonal state which helps to control weeds, reducing the need for chemicals and pesticides, and encourages flora and fauna to return, all helping to achieve positive water quality outcomes for the surrounding environment. Read more. 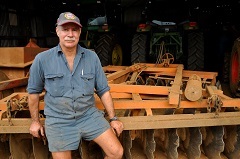 Ray Vicarioli’s cane farm in the foothills of magnificent Mount Bartle Frere brings unique drainage and soil hydrology challenges. On the Vicarioli’s 116 hectare property, a range of techniques have been employed to deal with the one raw material for which there is often a drastic oversupply - water. Sophisticated sub-surface drainage systems have been constructed to minimise nutrient volatilisation, maximise storage of nutrient in soils and largely eliminate chemical run off into drains. Read more. Mackay’s cane farming family the Bugeja’s have invested in low pressure centre pivot systems with the assistance of Reef Programme funding in a bid to achieve both environmental and productivity gains. Their most important piece of irrigation infrastructure is a 320 megalitre dam, helping to drought-proof the farm and doubling as a water recycling system that intercepts farm run off that could have been destined for the Great Barrier Reef catchment. The Bugeja’s irrigation practices are helping to reduce the potential for waterlogging the soil, deep drainage or run off, while increasing the farms overall tonnage. Watch more.